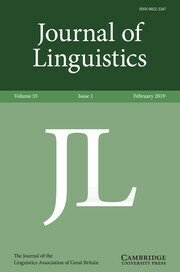 The latest issue of Journal of Linguistics (Volume 55, Issue 1) features a strong representation from LEL colleagues past and present. Andrea Beltrama and Emily Hanink investigate the hedging and mirative aspects of the particle like in English. The abstract and link to the full paper are available here. Gary Thoms and George Walkden look into vP-fronting, and identify two types of construction that merit different types of analysis. Intrigued? Read more about it here.